Moondance Diner The yellow moon lit up for the first time in Wyoming on New Years's Eve, 2008 with renovations nearly complete. The diner will open to the public on Monday, January 12th. View of interior View showing the new Moondance Diner interior, about 2 weeks before opening, during the family New Year's Eve celebration party. Cheryl and Tanya Sisters Cheryl Pierce (L) and Tanya Elliott are working together on the Moondance Diner project. Moonrail Custom Moondance logo design on the handicap ramp railing was done by metal artist John Dickie of Marbleton. 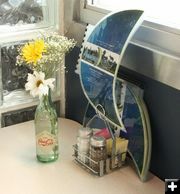 Remembering When the Moondance Diner was rescued in late 2007 it was in a very sad condition. Every effort has been made to preserve as much as possible of the original structure. The long-awaited opening for the Moondance Diner in LaBarge, Wyoming will be on Monday, January 20th. The fun moon menu includes breakfasts with items priced from $3.25 for hot cereal to $8.75 for "Orion�s Biscuits �N Gravy". 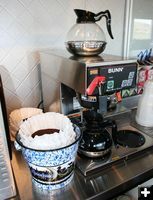 A cup of coffee "Rocket Fuel or Unleaded" is $1.00 including a refill. Lunch fare is available with all items priced under $10, from an "Intergalactic" ham and cheese sandwich for $5.25 to a "Mountain Man" beef patty sandwich for $9.25. You can get a basic burger "Big Dipper" or BLT for a reasonable $6.25. The dinner menu runs from "The Cosmonaut" fried chicken strips for $7.75 to "Stellar Ribeye Steak" for $21.50. Keeping alive the diner tradition for sweet tooth treats, the Moondance Diner Milkyway soda shop offers milkshakes and ice cream sodas for $3.50. The "Twinkle Twinkle Little Star" little tummy menu gets kids fed for under $5 a meal. The famed New York diner found its way to tiny LaBarge when developers bought the property on which it resided and wanted to clear the land for high-rise condominiums. The owners worked with the American Diner Museum to try and find someone who would be willing to purchase the run-down, but historic structure for a low price, on the condition they move it off the New York lot. 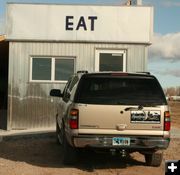 Intrigued by the $7500 price tag, and with two family members who drove truck and knew how to haul large loads, Cheryl and Vince bought the diner and brought it 2100 miles to LaBarge, a tiny town of just 431 residents (2007) in western Wyoming, in the fall of 2007. They have spent the time since then relocating the building onto a new foundation, salvaging what they could of the old structure, and incorporating it into a new building framework that can withstand Wyoming�s winds and snow loads. Originally, the Pierces thought they were just getting an inexpensive hull of a building that they could modify to meet the needs for their own diner plans. Once they purchased the building however, they realized they didn�t just have any building, they had "THE" Moondance Diner, an icon in New York City since the 1920s. The building was located near the Holland Tunnel in the SoHo District. It was featured in a scene in the "Spider Man" movie (MJ worked there as a waitress), as well used in scenes in numerous TV shows and commercials. Over the years, thousands of people have had a connection to the Moondance Diner while it resided in lower Manhattan. Once this was realized, Cheryl and Vince knew they needed to change their plans. They decided to renovate the diner as closely as they could to an architectural style as it was in the 1980s in a remodel done by architect Alan Buchsbaum. While respecting the old, the new Moondance Diner adds in some Wyoming touches to the mix, bringing new life to the building and launching a whole new chapter to the long, rich history of the Moondance Diner. Media attention for the Moondance Diner story has been quite a surprise for the Pierce family. New Yorkers have become enchanted with the saga of the diner�s cross-country move to Wyoming and the new life it will have in the tiny western town of LaBarge. People from all over the country have stopped by, called and e-mailed over the past year during the construction to show their support for the new home and life for the Moondance Diner. People wrote notes on the back of the �Coming Soon� sign on the construction site with messages saying, "We�ll be back for coffee when you�re open!" New York City Mayor Michael Bloomberg sent Cheryl and Vince a congratulatory letter in May offering his best wishes for their success. He said the diner was a bridge between New York and Wyoming. Judging from the numerous well-wishes that have come in from so many New Yorkers, the Mayor was right! This story is one of a young couple fulfilling the American Dream. They aren�t a big corporation with a ton of money to put into the project. They are a young family with two little kids, scraping together what they can to start a new business so they can make a living. They have been dealing with banks that are reluctant to lend money due to the miserable economy, yet they are committed to persevere and do the restoration right so it respects the history and culture of the diner as it was in New York, while still meeting the needs of their Wyoming customers. They have rallied many of their family members, relatives and friends to help on the project along the way. This story seems to have a magical energy about it that captivates the people it touches. On New Year�s Eve, the icon yellow half moon was installed in its place in the sign at the top of the building and was lit for the first time in its new home in Wyoming. Family and friends gathered inside to celebrate the progress and toast the New Year and new beginnings for the Moondance Diner in LaBarge. They look forward to all the new friends they will make when people visit and the stories they will hear from people who have ties to the Moondance. 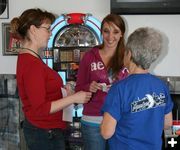 Most importantly, they look forward to continuing the tradition of serving good food to hungry people and welcoming everyone with Wyoming hospitality. A Grand Opening celebration will be scheduled for a later date to be announced. Directions to get to the Moondance Diner from New York are simple: Turn west on I-80 and go 2100 miles. Photos by Dawn Ballou, Pinedale Online! dawn@pinedaleonline.com Phone: 307-360-7689. Ready for customers View of the interior of the Moondance on Sunday, January 11th, the day before opening day. Flowers are on the tables, menus are out, staff is busy making final preparations, everyone is excited! 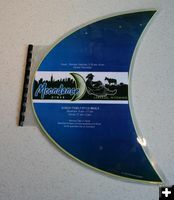 Moondance Menu The menu is, of course, moon shaped! 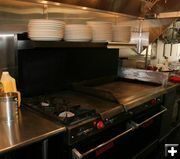 Moondance Grill A whole new chapter of Moondance meals are waiting to be cooked on the Wyoming Moondance Diner grill. Sharaea and Ilene Like real-life M.J.s (Peter Parker's girlfriend who worked at the Moondance Diner in the Spiderman movie), or Monica (from Friends), Sharaea Wright and Ilene Profit will be waitressing at the Wyoming Moondance. Now Open Banner A bright red "Now Open" banner sits on the counter ready to put outside for Monday's opening. Mayor Bloomberg Letter In April, 2008, New York City Mayor Michael Bloomberg wrote a very nice congratulatory letter to Cheryl & Vince Pierce on their efforts with the Moondance Diner. He wrote he considered the Moondance diner a kind of bridge from New York to Wyoming. 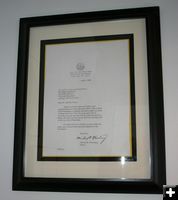 A copy of the letter is framed and on the wall in the diner. Mabel Lawler dollar bill Mabel Lawler, from New York, sent in this dollar bill as the first dollar for the Moondance Diner in Wyoming. It is on display in the diner. Reaching for the stars Sign by the cash register. Aunt Ilene Aunt Ilene kneads dough. She will be waitressing and cooking at the Moondance. You'll just have to meet her to see why she is so much fun and such a character! Cookie tins and travel mugs Moondance cookie tins and travel mugs sit ready to use on a shelf. Shoot for the Moon "Shoot for the Moon" lamp on Cheryl's desk in the Moondance Diner office. Making Hamburgers Cousin Kristy Sims came over to help in the kitchen and prepare hamburgers on Sunday in preparation for opening day. 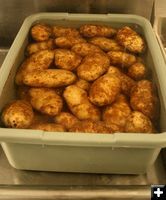 Potatoes soaking Potatoes are prepared to go into the french fry maker. Half Fast Cook Sign in kitchen. Guest ticket jackets A photo of the New York Moondance Diner sits on display in the new diner, along with guest ticket jackets from the original New York Moondance. Tanya and Judy Tanya and Cheryl's mother-in-law Judy, talk about the opening-day preparations on Sunday. 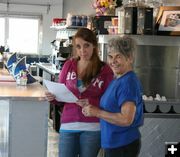 Many family members are pitching in to help Cheryl and Vince with the opening of the Moondance Diner. 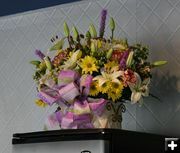 Good Luck Flowers Nearly 30 years ago Aunt Ilene ran a restaurant in LaBarge called the "Log Hut". 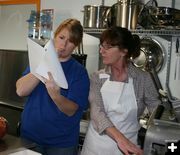 Now she is back helping with the Moondance Diner's debut. She gave Cheryl and Tanya a "Good Luck" flower bouquet for opening day. 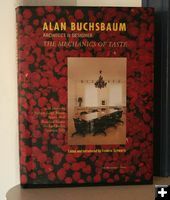 Alan Buchsbaum book The Moondance Diner has been remodeled to match the 1980s version done by architect Alan Buchsbaum. The inspiration photo for the remodel is in this book. 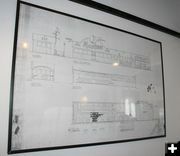 Architect Drawing A copy of the architect blue print for the original 1980s version of the New York Moondance Diner is framed and on the wall of the new Moondance. Table Menus The menus are on the tables ready for customers to read. Moondance on PBS On Sunday, Cheryl talks with Dennis Rollins with Wolf Gang of Wyoming, which is doing three days of filming of the opening of the Moondance Diner as part of the new season of "Wyoming Portraits" for Wyoming PBS, www.wyoportraits.com. Graffiti in the restroom We weren't quite sure how to tastefully take this picture, but we wanted to show the way they've incorporated the original graffiti from the old building into the decor of the new building. Other pieces are used in the new Moon Room addition to the dining room. Making Frenchfries Toni David, Cheryl's aunt, puts potatoes through the french fry cutter in preparation for opening day. Coffee is on The coffee was on for the staff Sunday before opening day. Discussing Opening Day Cheryl, Sharaea and Ilene discuss opening day. Moonwich please The Casper Star-Tribune has been closely following the Moondance Diner story. Reporter Jeff Gearino wrote a story entitled, "One moonwich, orbital fries and a satellite soda" on Sunday, January 11th, about the opening of the Moondance Diner. A link to that story is at the end of this article. Travis Elliott Travis Elliott, Tanya's husband, has spearheaded the carpentry work for the Moondance Diner renovation. On Sunday he was working on last-minute details before the diner opens on Monday. Vince and Clint Vince Pierce and cousin Clint Gilchrist discuss the outside of the Moondance Diner on Sunday. Clint will be installing a new webcam outside soon. Moondance Webcam A pan, zoom and tilt webcam is being installed on a light pole in front of the Moondance Diner. Plans are to program the camera to have a preset location where people can pose and get their picture taken in front of the diner (coordinate with a friend who is online and can control the camera and then have them save the photo). Stay tuned for the launch of this new webcam. Team Members Only Sign above the entrance into the kitchen. Not for Wimps Decorative cowboy boot on the wall of the Moondance Diner bears the inscription, "Wyoming, Not for Wimps". Seating chart Seating chart in the kitchen of the Moondance Diner kitchen.